Researchers are developing an archeological atlas of the Middle East that can be used with contemporary mapping applications to pinpoint locations. This will make decades-old satellite imagery available to scientists who need to know what a landscape looked like before the spread of cities and agriculture. Archeologist Jesse Casana and geoscientist Jackson Cothren published an account of the methods and examples of their work in the journal Antiquity. Using declassified images from a government satellite program called CORONA, the researchers are working with high-resolution digital scans distributed by the U.S. Geological Survey of film shot between 1967 and 1972. 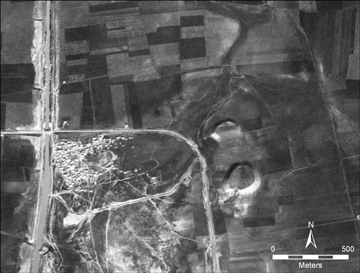 Looking at the ground from above can help scientists find archeological sites and identify ancient roads, fields and canals, but over the past 40 years in the Middle East in particular, expanding cities and agriculture have destroyed or obscured much of the archeological record. Casana estimates that there are hundreds, perhaps thousands, of unrecorded sites under reservoirs or beneath cities.